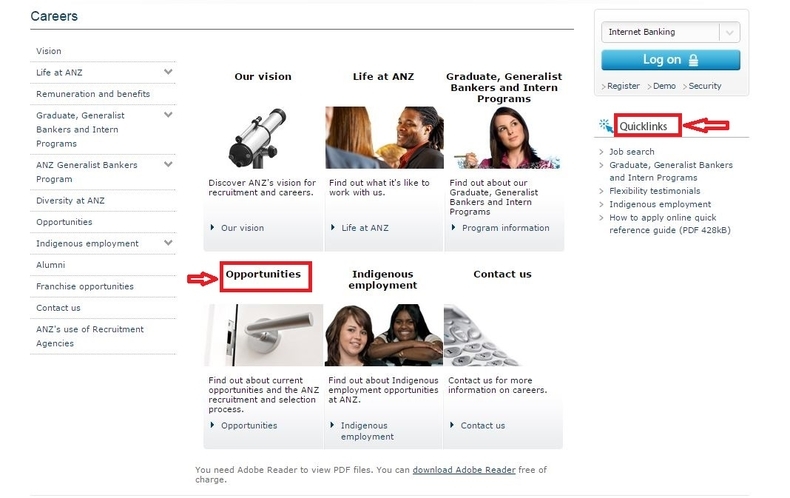 Land on the ANZ careers page at anz.com/careers and click "Opportunities" or use quicklinks at the right side of this page to help you with job search. Here, this article will take the former way as an example. After you choose "Opportunities" in the first step, you'll be led to the page below on which you could start job search by directly pressing the button or you can create/modify your profile first by clicking the button lower. Here we just pick up the former one - Job search. In this step, you can choose to search job by using the four criterias on the navigation bar, which means you can start with the basic job search, advanced job search, jobs matching your profile or just all jobs to view all possible opportunities. We'll just pick the first one - Basic Job Search. Here you need to specify your job search criteria by entering job number, keywords, job field and location and then click "Search Jobs". 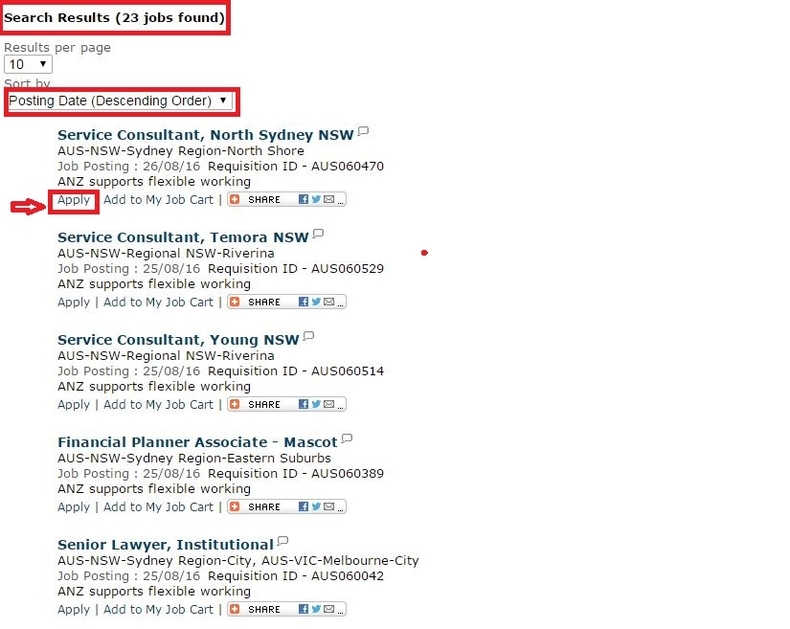 Or you can just view the search results listed below to find one ideal job. Search tips and candidate profile are presented at the right side, you can refer to them if you do not know how to go on with your application. In the last step, we put keywords and job number along with other filter criteria and we are presented to the page below on which 23 jobs found are shown, among which we could also sort out the exact job you want to apply for by using the sorting criteria. After you fixed on one, click "Apply" as the arrow points to start your real application process. Upon completion of the fourth step of selecting the your ideal job title, you're asked to accept the Privacy Agreement in this step. Read it carefully and pay attention the the sentence: Any information you provide to ANZ must be complete and accurate. In this step, you're asked to log in with your ANZ account by providing the information requested in the fields , then click "Login". If you are not registered yet, click "New user" and follow the instructions to create an account. Or you can choose to sign in with your Yahoo account to continue with your application. 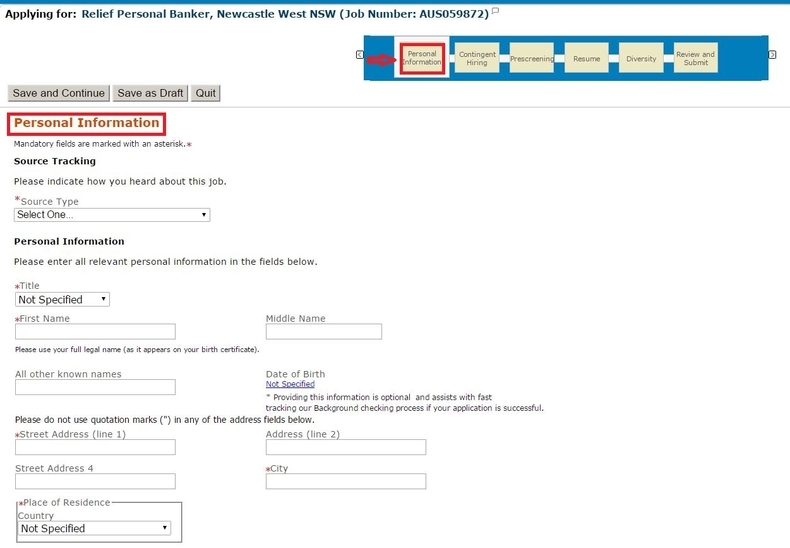 You are shown the current status of ANZ job application as the arrow points, which means you only have five steps to finally complete the whole application process. 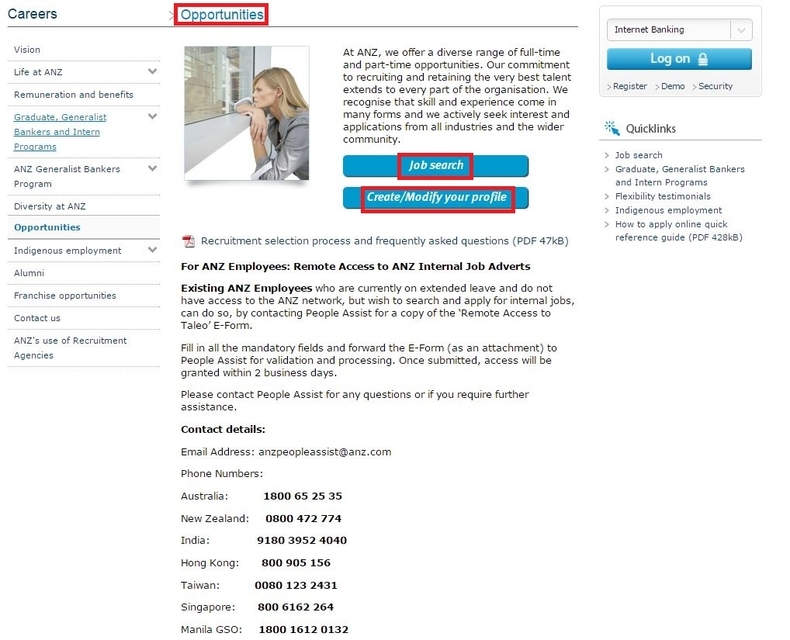 Right here, you need to fill out your personal information by indicating how you heard about this job, entering all relevant personal information in the fields such as your name, address, email address, your former employer,etc., answering questions of whether you are related to anyone who works for ANZ, giving details about that and whether you've been employed by ANZ before and appointed to the ANZ graduate programme previously. Step 8 actually combines two steps in the application process, one is the Contingent Hiring and the other is the Prescreeening part. If you are considering contingent/contract opportunity, you are required to fill out the fields shown in the picture including Currency, Contractor Rate, Daily/Hourly/Monthly Rate, Date of Availability or type your available date or period. Or you can click 'Save and Continue' to proceed to the next page. Afterwards, you'll directed to the prescreening page which lists several questions like “How much notice would you require prior to starting a new role?” “Have you worked at ANZ before?” “ Do you require any adjustments or support to assist you to work at your best in this role?” etc. In this step, you're asked to attach files to the candidate record (e.g. : cover letter, resume, references, transcripts, etc.). Once a file is attached, you can overwrite it by attaching a file with exactly the same name and extension. Afterwards, you'll be led to the page asking you to provide the information regarding diversity by selecting your age bracket, indicating your cultural/ethnic background and answering questions like whether you consider yourself to be a person with a disability and tell what's the type of disability and whether you are willing to participate in ANZ programs to support the company's diversity goals. After you go through the last step of uploading your resume and providing info about diversity, you'll be asked to review and submit your application, just click "Submit" and you'll see your status of application. The page below shows that you complete the whole process. Click anz.com/careers to apply for ANZ jobs online.